Gadar Max is Selective pre-emergent & pre plant incorporation Herbicide. It is used to control most annual grasses and some broad-leaved weeds. Gadar Max is recommended for use in Soybean, Cotton, Chilli. It is based on advance capsule technology in which a.i. is packed in small capsules and absorbed through both the leaves and roots of target plants. Capsule locked Gadar Max retains in soil, hence provide time to the farmer between spray and irrigation. It spreads on soil and disrupts cell division at the time of weed seed germination. It controls E. colonum, Commelina spp., Digitaria sanguinalis, Dactyloctinum aegyptium, Amaranthus viridis, Euphorbia geniculata etc. It doesn’t show any harmful effect on crops and soil. 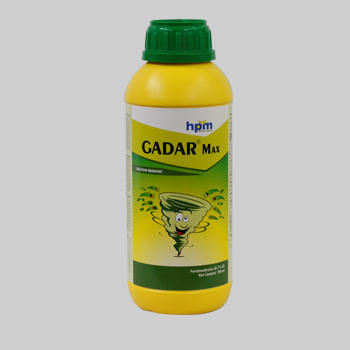 It is recommended to use Gadar Max at 600-700 ml per acre. Pendimethalin is an herbicide of the dinitroaniline class used in pre emergence and post emergence applications to control annual grasses and certain broadleaf weeds. It inhibits cell division and cell elongation. Microtubule assembly inhibition. Selective herbicide, absorbed by the roots and leaves. Affected plants die shortly after germination or following emergence from the soil. It is recommended for use in soybean, cotton, chilli. It protects crops like wheat, corn, soybeans potatoes, cabbage, peas, carrots and asparagus. It is used to control annual grasses and certain broadleaf weeds which interfere with growth. It inhibits root and shoot growth. It controls the weed population and prevents weeds from emerging, particularly during the crucial development phase of the crop. Material insoluble in acetone, percent by mass , Max. Strong alkaline material, acid or oxidizing materials. The major metabolic routes for pendimethalin involve hydroxylation of the 4-methyl and N-1ethyl groups, oxidation of these alkyl groups to carboxylic acids, nitro-reduction, cyclisation and conjugation. Not toxic for birds, mallard ducks, bobwhite quail. It is very toxic to fish, rainbow trout, bluegill sunfish, channel catfish. It is non toxic for worms. It is non toxic for bees.